April has a been a complete and utter whirlwind of a month. Now with 3 days into May, I can finally look back at April with a grin on my face and knowledge that rarely have I experienced time periods with such amazing live music. The first show was Young the Giant with St. Lucia at the Cosmopolitan Resort’s Blvd Pool. You already know how much I love that venue. I was a bit nervous that St. Lucia’s sound would not work outside. Let me tell you how wrong I was. St. Lucia put on the second best show I’ve seen at the Blvd Pool (only Edward Sharpe & the Magnetic Zeros were better). It was obvious most of the crowd was there for YTG, but the energy level of St. Lucia was incredible. It is very clear that Mr. St. Lucia himself and front man of the touring band, Jean-Philip, loves what he does. He had a huge smile on his face during the entire show. I cannot wait to see them live again. Young the Giant was also fantastic. Show two was the one I thought would be the highlight of April (I’ll get to that later). On the bill was White Lies, The 1975 and The Naked and Famous. If you’ve read this blog, you know how I feel about TNAF. This was my first show at the brand new Brooklyn Bowl Las Vegas. After having seen 6 shows at the BBLV this past month. I can tell you that I’ve never felt this way about a venue before. This venue knows my needs and desires. The Brooklyn Bowl completes me. I had a feeling that TNAF would be an “inside” band. This show was far and away better than their show at the Cosmopolitan pool in October. I was very impressed with White Lies. I didn’t like their album so much, but when they preformed these songs live, I felt like I was present for the heyday of the Cure. Their sound is very strong, clear and Cure like (which is not a bad thing in my book). My favorite song of the evening, (no shocker here) was “Girls Like You” from The Naked and Famous. 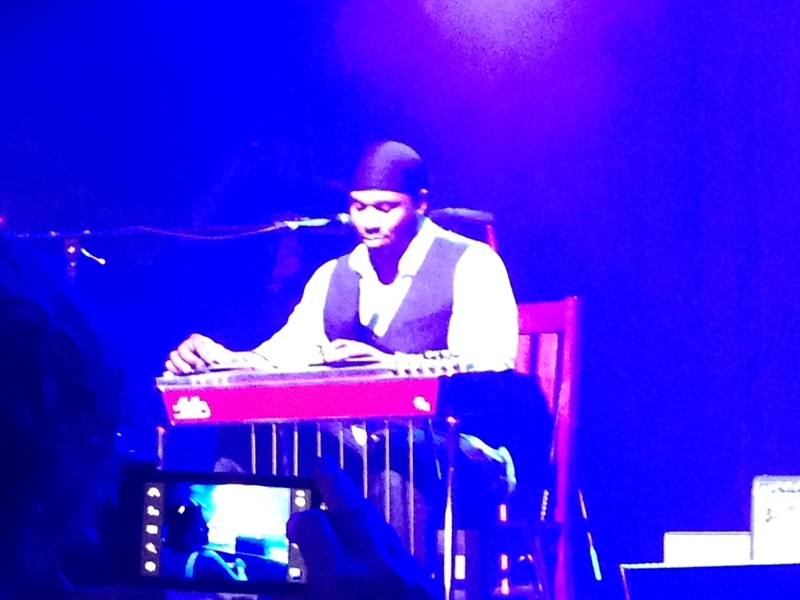 Show number three was also at the Brooklyn Bowl…This time it was Robert Randolph and the Family Band. I’ve been a fan of RRTFB since the early 2000’s, but never lived anywhere he would tour…until now. He played super late shows (4:00am) and afternoon shows (1:00pm). I saw him on Easter at 1:00pm and it was as close to god as I may get. The man plays the sacred steel like no other, and despite the small crowd (of mostly Phil Lesh fans from the night shows) Robert Randolph and his band (many of them actual family members) had huge smiles on their faces during the very jam heavy set. Show number four was one I was hoping to see but wasn’t sure. I like “dad rock” and despite what others may think O.A.R. fits into this category. Now, don’t get me wrong, they are a great band with a great number of excellent songs, but they tend to skew a bit to the late 30’s early 40’s demographic…aka…young dads. I went to the show with a group of people I never met before, and had a blast. I saw the band on the their 3rd night of a 3 show weekend at the Brooklyn Bowl. As a band with a very deep catalog, I know that each show was different. For the final show, the band had a full horn section which was not present in the previous two shows. I was an OAR fan before the show, but as with many bands…now that I’ve seen them live, I am hooked. I would love to see them again. After seeing them live, their song “Shattered” is now one of my songs of the season. Not to be outdone by April, May has started off with a bang. Two shows in the 3 days. The first was the 1970’s hard rock band Wishbone Ash performing their classic Argus in its entirety. I was not familiar with this band, but did recognize their music. It is obvious by looking at the lead singer/co-lead guitarist Andy Powell that drugs may not have been as big of a priority for him as with his contemporaries. It was clear why Andy Powell is one of the most important guitarists in rock history (Traffic Magazine). And then of course, I saw Gogol Bordello again. Next week May kicks into high gear with Hunter Hunted, NONONO and Twenty One Pilots…but that show deserves its own post. Much of my early music education took place during the late 80’s and early 90’s when synth heavy pop found significant airplay on the radio and MTV. Some of my favorite groups growing up included some of the more well know synthesizer heavy groups like Erasure, Depeche Mode and Tears for Fears. While I am not happy that 80’s and 90’s fashion trends are coming back, I am very happy that this style of music is making a comeback. Many of this current wave of synthpop bands have had relative commercial success like SandyBeats favorites The Naked and Famous and vets, M83. There are two bands in particular that I have been grooving to recently. The first lead me to the second. Brooklyn based St. Lucia (or Santa Lucia (loo-see-uh) to some) reminds me of the 80’s music I loved so much but with a contemporary vibe. St. Lucia (which is essentially just one guy, South African born Brooklyn resident Jean-Philip Grobler), is the producer of the album from my other guilty pop pleasure, HAERTS. HAERTS is a bit more introspective than St. Lucia and features a very strong and ethereal lead singer, Nini Fabi. Enjoy Hemiplegia (from their newest EP of the same name). Both acts are touring and appearing at various festivals during the spring and summer. I know I am hoping to see St. Lucia when they come to Las Vegas with Young the Giant.